For years we had people clamoring for a playoff. Everyone wanted the “national championship” decided “on the field;” and now, we finally have this reality in the form of a four-team playoff. We even have a selection committee who picks the four playoff teams (as opposed to the polls and computer rankings under previous systems), which is exactly what everyone thought would work best as it is what the NCAA uses to select teams for the annual basketball tournament. Does this sound familiar? It should, because it is eerily similar to what we had under the BCS system (and/or earlier systems). What it boils down to is that most college football fans have no clue what they want, or the best way to provide it. The only things that everyone agrees on is that chaos and complaining are both good. College football fans are eternally upset and unhappy, which is not entirely their fault. I mean, of every sport one could follow, I know of no other that torments or abuses its own passionate fans more than college football. However this abuse is only 50% of the problem; as the other 50% is a direct result of most average fans having no clue what is good for them or the game. Don’t misunderstand me, as I don’t necessarily know what is best either, and this is why I am as tormented as the next guy. Anyway, the 2017-2018 national championship game was amazing. It was also (almost) a second SEC title game as Georgia won the 2017 SEC Championship without having to play Alabama. If they had played Alabama, maybe we would have a different SEC Champion? Maybe we would have had a different four teams in the playoff? Oh well, it doesn’t matter. 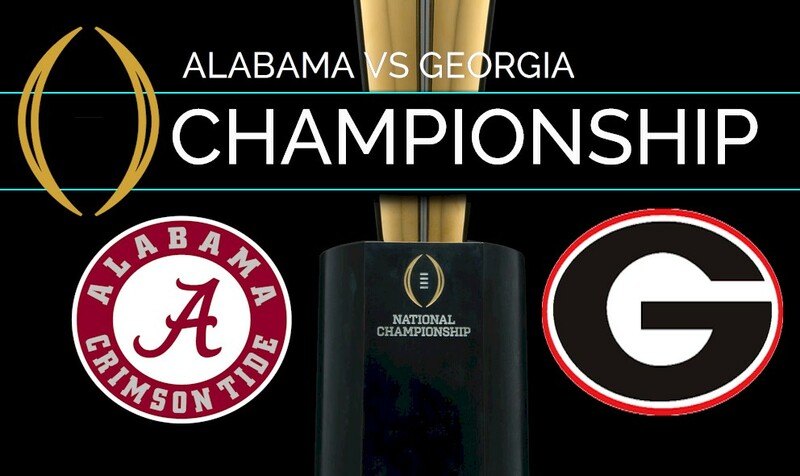 Even though Alabama won tonight, Georgia is still the SEC Champion, and Alabama is the National Champion; and they both deserve it. I can’t imagine having it any other way. Now that it is all over, I can’t imagine having any other team sitting on top, other than Alabama. Heck, I can’t imagine Alabama having to play any other team other than Georgia to get there. I can’t imagine going to a national championship determination system that would insert an element of subjectivity that specifically forced a playoff between teams from different conferences simply to offer a more diverse field of teams. Do we want a system that (while imperfect) tries to get us as close as possible to crowning the best team as national champion, or do we want a system that tries to make everyone happy? I heard someone say that they wished the national championship was between one SEC team and one team from another conference. They wanted this because it would be representative of more college football fans, and would include more people from around the country. But is that really what we want? Do we want to insert a different team into the national title game, that may not be as deserving, only to include a different conference? I thought the point was that we wanted the best two teams, regardless of conference affiliation? tonight’s game was awesome; it was hard-hitting; it featured two teams that desperately wanted to defeat each other due to their natural rivalry; and two coaches with a teacher-student relationship. It was the best two teams in the country, battling it out for supremacy of the game. What more could you want? So what if it was SEC vs. SEC? It was awesome, and I, for one, will not apologize for it. After the game I was driving home, thinking about what I had just witnessed and what I was going to write about. The one thing I probably thought more about was that I had just seen Nick Saban tie Bear Bryant at six national titles. I also thought about how Nick Saban could easily coach another ten years; and if he does keep coaching, I don’t see why he wouldn’t win at least one more (if not several more) national titles. Why? Why can Saban do it but no one else can? This post is not about Saban’s “Process,” as you can read about that somewhere else. (There are literally hundreds of articles on Saban’s “Process;” here is one from 2013, 2014, 2015, 2017, and 2018). However, I would love nothing more than to sit down and have a deep and philosophical conversation with Nick Saban about his “Process.” I don’t mean an Xs and Os discussion, but a conversation about the “hows” and “whys,” or about all the little things that make people work together. He clearly understands human behavior in a way that so many of us do not; and not only does he understand it, but he is able to teach it as well. Regardless of the team you are trying to build, I would be willing to bet that Saban’s “Process” would build the best team in any particular environment. He apparently has the ability to take gifted athletes and turn them into a machine that operates like no other. This is the deep and philosophical conversation I would like to have with him. These are the topics I would like to discuss. Every now and then, a person comes along, and they have an uncanny ability to make people do extraordinary things. These people are rare and special, and they don’t come around very often. I really think Nick Saban is one of these types of people. In fact, from a college football standpoint, I think he might be the next Fielding Yost. Fielding Yost was born in Fairview, West Virginia in 1871. Nick Saban was born 11 miles away in Fairmont, West Virginia in 1951 (just 80 years later, and only five years after Yost passed away). Yost is most famous for being the head coach at Michigan, and having a “Process,” of which he demanded a strict adherence to by his players. While Saban is best known for his time at Alabama, he was the head coach of Michigan State from 1995-1999. Despite the West Virginia and Michigan connection, both men are/were fond of their “Process,” and it led to amazing results for each coach. Fielding Yost was famous for having a Process that was drilled into his players. He would tell them that if they would just follow his Process, and do as they were told, everything would work out. From 1901-1904, Fielding’s Michigan teams did not lose a game, and they only lost one in 1905. Why did they win so much? Because the players learned his process, and they executed it the way he instructed them too. It was almost as if Yost wanted to remove a player’s ability to think from the game, as there were no decisions to be made. Of course, I am sure if you ask around, every coach will tell you that he has some sort of process. The difference is that Yost and Saban apparently understand people on a deeper level. They can connect with people in a different way and get people to do things that you or I could get never get them to do. Yost died in 1946, so I have only read about him and heard stories of his success; however, I am fortunately getting a chance to watch what might be the second-coming of a coach like Fielding Yost in Nick Saban (and it is a thing of pure college football beauty). Have there been other Yost’s before Saban? I don’t know. I do know there have been some great coaches including Bear Bryant, Pete Carroll, and a few others. However, I am not sure if they were truly the same as Yost and Saban (based on what I have read about him, Bryant may have been). The 2017 season is over; and it feels like it only just started. There will be no more college football until sometime in late August 2018. While I love watching the national championship game every single year, I hate the hangover it leaves me with. It is a huge build up, an amazing game, and then … nothing, nothing for seven long months. It is a long stretch of time before the glorious and beautiful game of college football returns, and until then, those of us who have been cursed by a true obsession for the game will go through several stages of withdrawal, including denial and depression, before Summer turns into Fall and we start over again. This entry was posted in Alabama, Bowls, Georgia, National Champs, SEC by Travis Normand. Bookmark the permalink.